DE La Salle rookie Jolina Dela Cruz didn’t want to let her team down in a battle of school pride against archrival Ateneo. Dela Cruz, once again, rose to the occasion for the Lady Spikers, scoring 14 points to end the Lady Eagles‘ 10-game winning streak, 25-17, 25-13, 25-23, on Saturday in UAAP Season 81 women’s volleyball tournament before a roaring crowd of 15,854 at the Smart Araneta Coliseum. “Parang kahit bago kami, andun yung pride talaga. Ayoko matalo dito,” said the 19-year-old rookie after La Salle swept Ateneo in the elimination round. In their first meeting last February 17, Dela Cruz also shone bright and had 11 points in La Salle’s campaign-opening four-set conquest over Ateneo. The prized recruit from Academia de San Lorenzo in Bulacan just wanted to fight for their school pride against their perennial rivals. 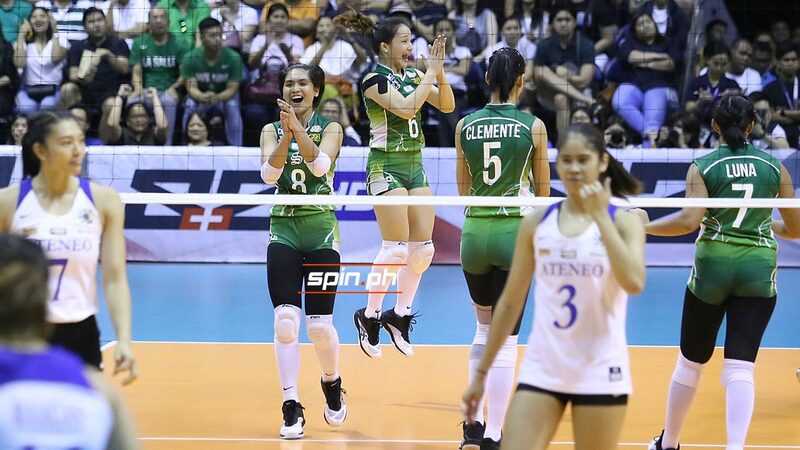 The young opposite spiker is just repaying the faith of head coach Ramil De Jesus and the coaching staff on her that’s why she is dedicating this big win to them as La Salle clinched a Final Four berth — its 11th straight postseason appearance. The La Salle coach, who earned his 19th postseason appearance in his 21 seasons, knew that Dela Cruz could carry the Lady Spikers. La Salle will take a Holy Week break and it has to sweep its last two games against University of the East on April 24 and Far Eastern University on April 28 to secure the twice-to-beat advantage. Dela Cruz is ready to flip the switch as she enters the climax of her first season and it will start in their team practices.